Life at three is big. All day, every day is a full bodied experience. Constantly in motion, my son, Alex, has been known to rack up thousands of steps/wiggles as he's watched a movie. I know this to be true because about six moths ago I strapped a pedometer to him, just to satisfy my own curiosity. My boy is a super sensitive creature, he always has been. At three his feelings are even further exaggerated. His emotions are all encompassing. If he's glad, he is elated. If he's sad, he is drowning in misery. There is no middle ground. It's exhausting for him and for both of his parents. Our conversations together are frequently weird and wonderful. I'm often equal parts amused and delighted by his ponderous mind. He is one of those people who loves to pull things apart to see how they work and to know why they do that thing that they do. He is obsessed with finding out how things are made. This boy asks A LOT of questions. Alex and I spend countless hours looking things up "on Gooooooogle". He is pumped when there's a Youtube video of "How do they make glass?" or "Why is lava? ", "There's bones in me?" which led to "What does my skeleton do?" Our TV features a voice activated search, so at the touch of a button he's able to jump online and look up anything his heart desires. It has helped enormously with his pronunciation. You can't search for firetruck without an F. How great it is to be Lord Commander of a voice activated remote control. This kid has no idea, he's living in the future. Anyway, one of his interests over the past few months has been magic. His laterally thinking brain knows it's not real, even at three, but he adores the playfulness, the wonder, the excitement. He searched for "something magical" online and a video for Disney's Cinderella popped up at the Fairy Godmother's scene. Alex pressed play. Watching his face as for the first time he witnessed four mice become horses, a horse become a coachman, Cinderella's dress transform and of course, the pumpkin. Well we all know about the pumpkin. On his face was unmistakable pure delight. A memory that I hope stays with me for a very long time. Following that scene Alex turned to me and said "That pumpkin's a horse-car. That's silly." A little while later was the Queen's birthday and his daycare was having a royal celebration. Come dressed up as a queen, a king, a princess or prince! In the lead up I asked him, MANY times if he'd like to dress up. "Would you like to be a queen, a king, a princess or prince?" Time and time again. "No thanks." was his answer. Until the morning of the big day. 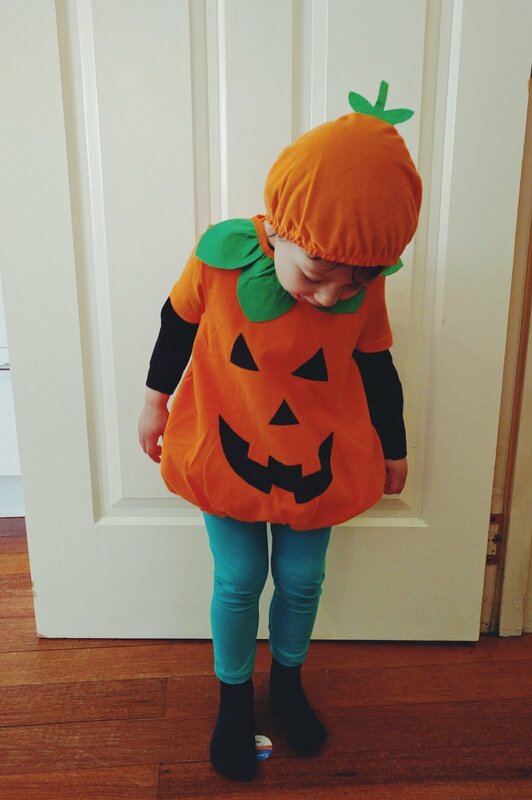 "I want to be a pumpkin!" He sobbed with teary eyes, as I dropped him off at 9:10am. I had to get to, and start work at 9:30am. It was not going to happen. There was nothing I could do. A pumpkin. He wanted to be a pumpkin. I had asked the wrong question. Cinderella wasn't the amazing magical thing, the pumpkin was. The pumpkin twinkled in the moon light as is sped through the night on it's way to the castle. The pumpkin was where it was at. Well I thought I'd hear about it for a day, a week, surely not more than a month! Was this child an elephant who never forgets in a previous life? Oh, let up kid! Talk about carrying a grudge. 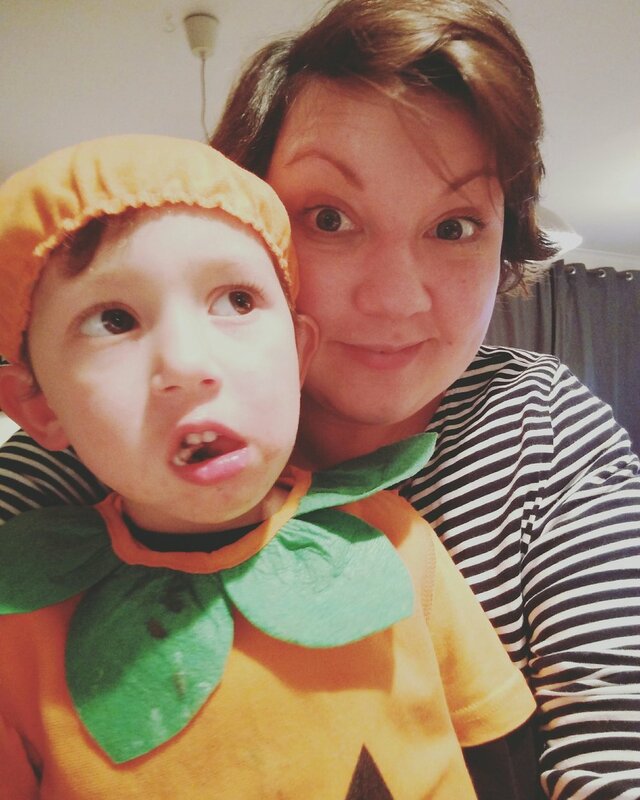 "I wasn't a pumpkin!" he'd loudly state with sad eyes, every couple of days. And then, thank the sweet gods of consumerism, Halloween was approaching! 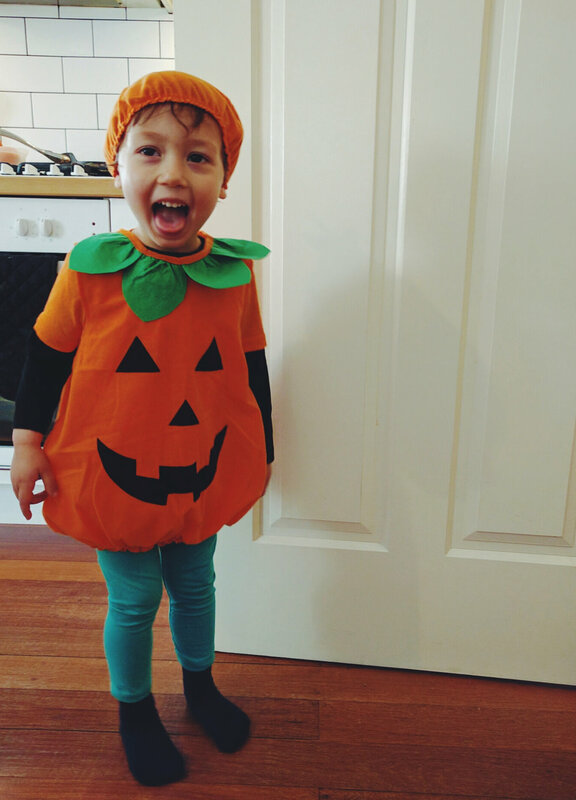 His daycare once again had a dress up day and guess who went as the happiest little pumpkin you ever did see? Alex! I'm reminded of this tonight. As I washed his grubby face and his adventurously filthy body in the bath he requested the "Magic-a-boo song", from Cinderella. I sang it to him as I washed him. I sang it to him as I dried him. I sang it to him as I dressed him. We sang it together as I tucked him into bed. I am damn sure this parenting thing is the hardest thing I've ever done, but there's magic, REAL magic that shines in his eyes each and every day and it's moments like these that melt my heart. Sleep well little pumpkin. My three year old pumpkin and his trusty sidekick, one year old Batman.